to black Friday and cyber Monday deals. I knew quite well ’twas an old product before going for it, all I needed was a louder speaker system to complement the Bluetooth one I am using now. 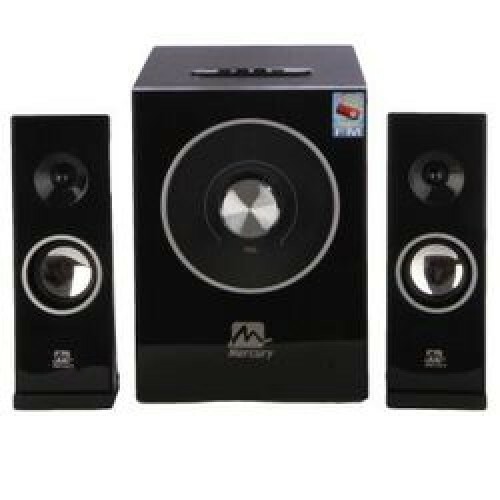 The mercury SW5200U is a nice multimedia speaker with FM, USB storage devices and SD card support. Comes with a fancy blue led and multimedia control switch. There’s the bass control switch at the rear of the speaker system and the volume control button at the front. The woofer also has an efficient signal-to-noise and noise separation technology. I was really impressed with the available connectivity options, after 30 minutes of testing the device, I was able to connect it to my LG flat-screen television, mobile phones, laptop and a dvd player system. The features are quite robust and worth paying for at the low price it is being sold. As expected, the mercury SW5200U multimedia system speaker comes with a voluminous manual for instructions, how-to-use and caution for disposal. Has an audio connectivity cable, power cable and two small speakers that are connected to the sub woofer system via an audio cable. The mercury SW5200U sub woofer system multimedia speaker with FM, USB storage devices and SD card support goes for about NGN8,000 ($44) in Nigerian stores and can be purchased from any eCommerce, Online shopping websites. A very decent multimedia speaker with Signal-to-Noise and Noise Separation technology. The price is good and the production is quality. The support for sd card and other storage media makes it a superb sub woofer system for students and youths alike. I can also recommend this product for home use.